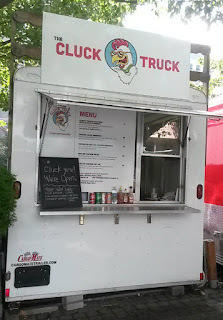 The Cluck Truck is located near SW 10th and Washington in downtown Portland, Oregon. 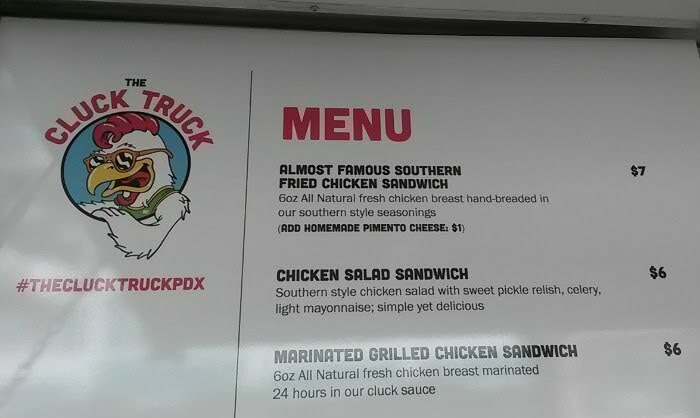 Yet another new food cart has surfaced in downtown. 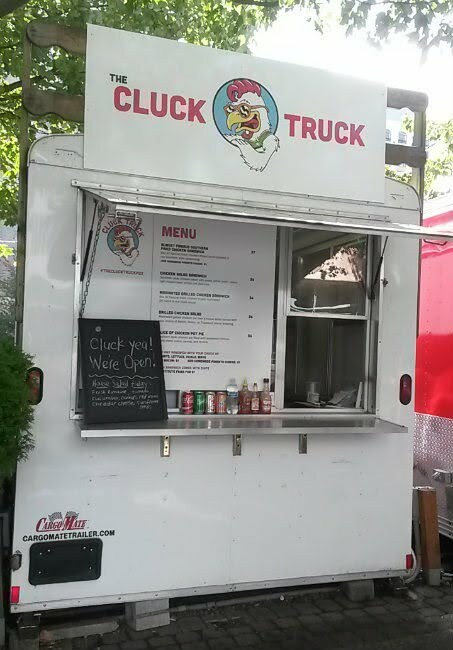 The Cluck Truck opened around August 21. 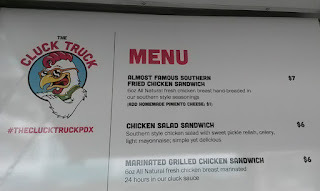 As one might expect, this place focuses on chicken. 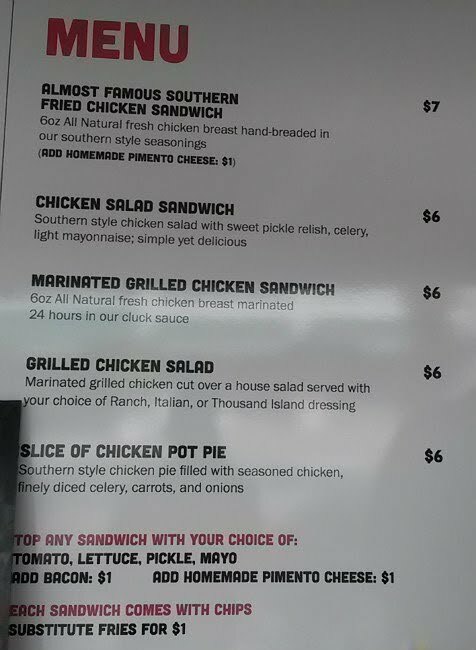 I like their fairly simple menu: a couple sandwiches, a salad, and a pot pie. I ordered the "Almost Famous Southern Fried Chicken Sandwich" ($7), which starts with a 6 oz. 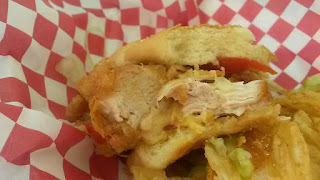 chicken breast hand-breaded with their secret Southern-style seasonings and fried. You can add lettuce, tomato, and mayo if you wish. 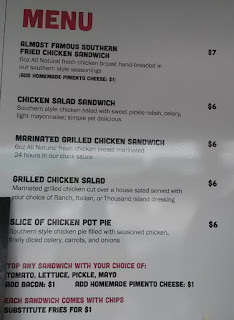 I 86'd the mayo, but did add their fresh homemade pimento cheese for $1 more. Extremely juicy chicken, with excellent seasoning and breading. Loved the crunch. The pimento cheese added a slight kick. Very good bun. Can't beat fresh lettuce and tomato. The overall quality really makes it a damn good deal for $8. 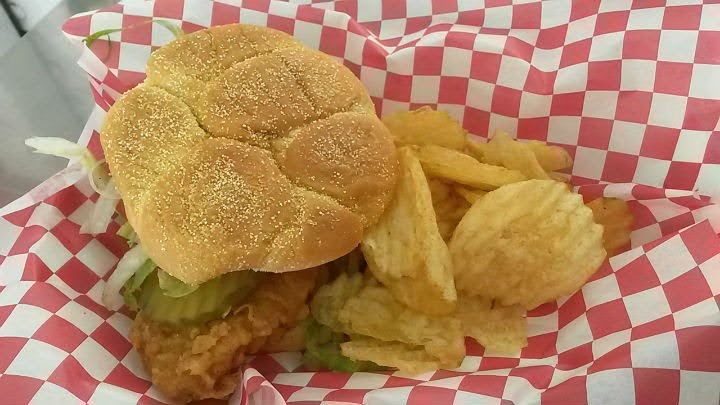 Each sandwich comes with free potato chips, but I overlooked that I could have tried their fries for $1 more. I would have rather tried the fries instead of standard rippled chips. Panda problems, I know. There are a few standard hot sauces available at the cart, should you need a bit more kick. Pandas just bring their own hot sauce to the dance. BYOHS FTW?